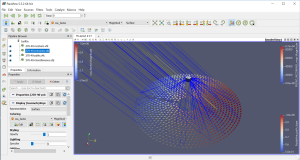 The SOLSTICE SOFTWARE is an executable producing flux maps (and other data in ascii) based on input files (.yaml) defining the geometry (e.g. 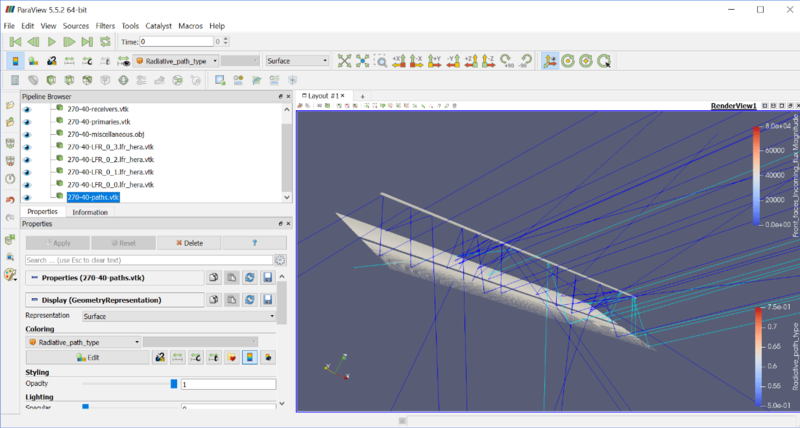 reflecting, refracting parametric surfaces or Computer Assisted Design, CAD, geometry in STL format). Its fast computation capability (Intel library Embree, and parallelization) allows researchers and engineers to design solar concentrating systems. 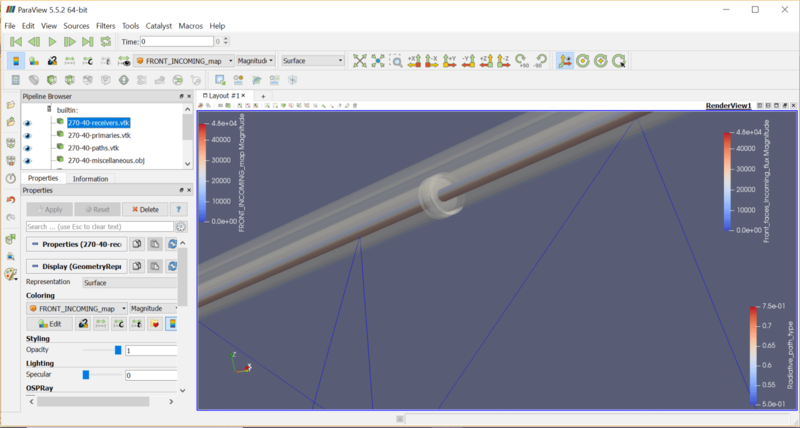 Inserting CAD geometries for critical components in SOLSTICE simulations enables thermomechanical stress and Computational Fluid Dynamics (CFD) couplings to be performed on representative geometries. 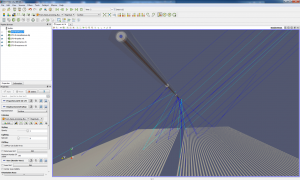 To simulate all types of concentrating optics (reflecting or refracting materials). To optimize the aiming strategy in solar tower facilities. To characterize the heliostat canting errors. To compute Incidence Angle Modifiers from any linear concentrating system. 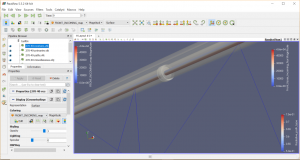 The capabilities of the SOLSTICE SOFTWARE were designed from the needs of the PROMES-CNRS research laboratory. Meso-Star SAS was chosen as the developer of the SOLSTICE SOFTWARE. The SOLSTICE SOFTWARE was funded by the French "Investments for the future" program managed by the National Agency for Research under contract ANR-10-LABX-22-01-SOLSTICE (LABEX SOLSTICE). The SOLSTICE SOFTWARE is an Open Source and Free GPL GNU License program. It is running on Windows and GNU/Linux operating systems (dedicated download files are available). The executable “solstice” is a command-line tool that requires defining few options and input files to produce output files. This command line could be used alone in a Terminal/command Prompt or inside any program by using a system command enabling to run the executable “solstice”. 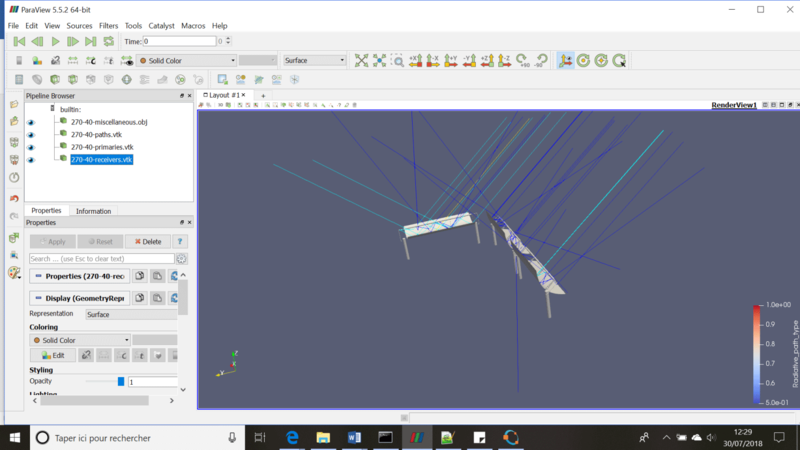 For example, a program designed to optimize a heliostat field would change the location of each heliostat, run “solstice”, post-process the output and iterate again with new heliostat locations. To obtain a cutting-edge ray-tracing computation, and have fully Open Source Software, the algorithm used results from research (PROMES, LAPLACE, RAPSODEE laboratories scientific articles [1-3]), and the Embreelibrary from INTEL was used. In addition, The SOLSTICE SOFTWARE is fully parallelizable in shared-memory architecture. 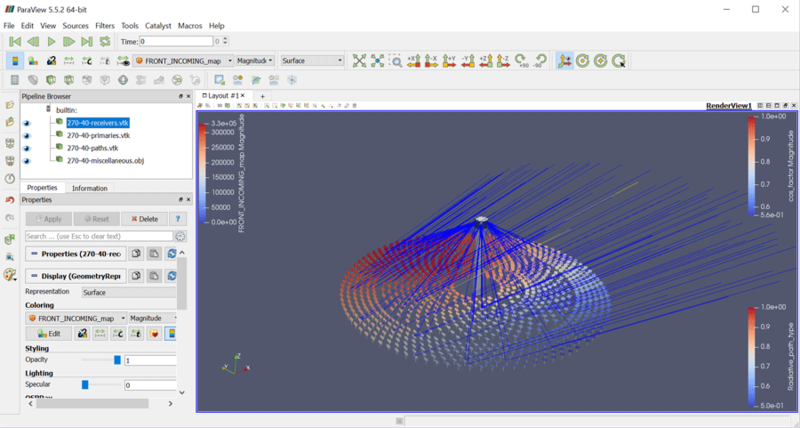 INPUT files are necessary to describe the scene useful to the computation of flux maps and contain all the material properties and surface geometry (including paths for the STL geometry) written thanks to a dedicated language (see documentation) in a YAML format. These input files could be written and modified manually but they could be produced by any program: e.g., when large input files should be created depending on large data size, a program (C, Python, Matlab, Scilab, Fortran, Java, etc.) is useful to print the ascii input file in YAML. 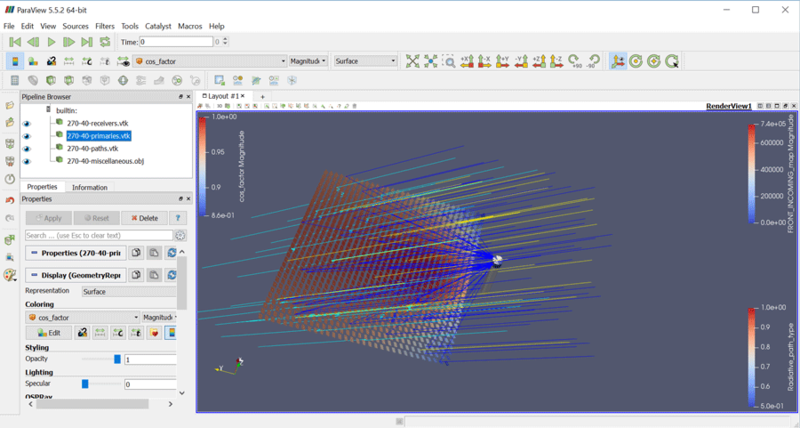 OUTPUT files are generated depending on the options defined with the command “solstice” and include the flux maps, ray paths and the geometry that could be visualized in Paraview (Open Source and Free Software). J. Delatorre, G. Baud, J.J. Bézian, S. Blanco, C. Caliot, J.F. Cornet, C. Coustet, J. Dauchet, M. El Hafi, V. Eymet, R. Fournier, J. Gautrais, O. Gourmel, D. Joseph, N. Meilhac, A. Pajot, M. Paulin, P. Perez, B. Piaud, M. Roger, J. Rolland, F. Veynandt, S. Weitz, Monte Carlo advances and concentrated solar applications, Solar Energy, 103, 2014, p. 653-681, https://doi.org/10.1016/j.solener.2013.02.035. B. Piaud , C. Coustet , C. Caliot , E. Guillot , G. Flamant, Application of Monte-Carlo sensitivities estimation in Solfast-4D, SolarPaces Conference 2012, Marrakech, Marocco, 2012, p 1-9. C. Caliot, H. Benoit, E. Guillot, J.-L. Sans, A. Ferriere, G. Flamant, C. Coustet, B. Piaud. 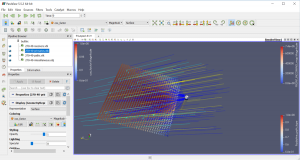 Validation of a Monte Carlo Integral Formulation Applied to Solar Facility Simulations and Use of Sensitivities. ASME. 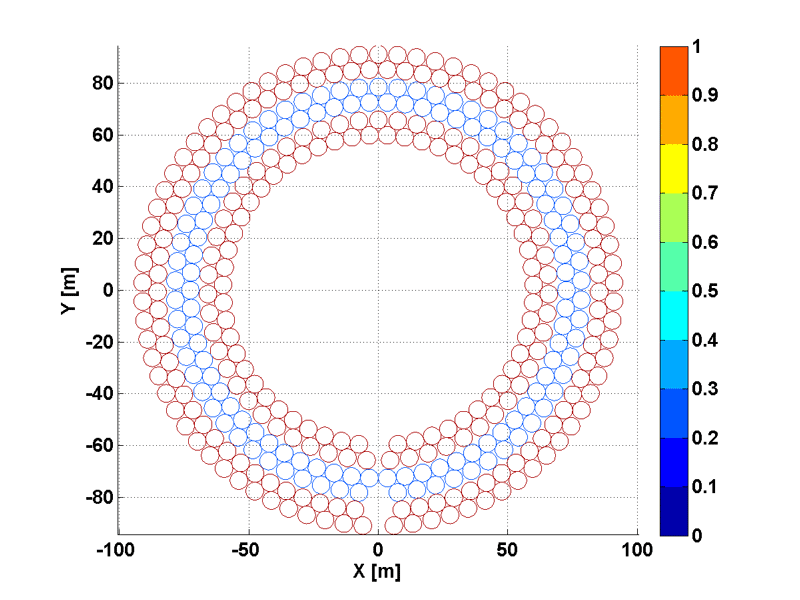 Journal of Solar Energy Engineering 2015; 137(2): 021019-021019-8. doi:10.1115/1.4029692. Note that you don’t need to install an executable, only download and save the zip-files. Be careful to download all the modules to compile C programs. 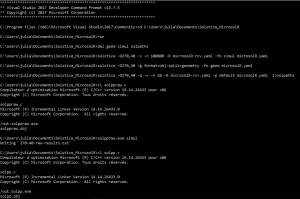 Run “developer prompt” of Visual Studio “as an administrator”. If it’s different please check the installation of C and C++ compiler of Visual Studio. Download the files (.yaml) and save them in a directory. Unzip the files in a Directory named “MICROSOLR”. Download the files for the post-processing of Solstice (https://www.meso-star.com/projects/solstice-resources.html). Additional resources page, and download the Sources tarball in the Post-Processes section), extract all the files and save them in the same directory as the .yaml previous files (solmaps.c, solpp.c, solpp.h, solpaths.c, solppraw.c, Makefile is for Linux OS). Open the READ-ME.txt file. Copy it and save it as ‘run.bat’ in the MICROSOLR directory, this will be the list of command to obtain all the results of this tutorial. 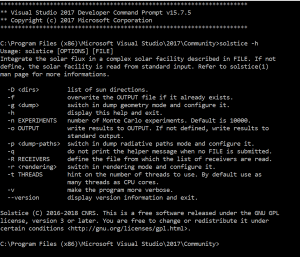 Open your C compiler VS2017 (Run as administrator) Developer Command Prompt for VS 2017. Change directory (“cd path_to_MICROSOLR” command) to the MICROSOLR directory where the .bat, .yaml and post-processing (*.c) files are located. Enter “run” in the Developer Command Prompt for VS 2017 and hit Enter. Please check that 7 files were created: 270-40-miscellaneaous.obj, 270-40-primaries.vtk, 270-40-receivers.vtk, 270-40-raw-results, solpp.obj, solppraw.obj, solpaths.obj. To see the absorber, select the “miscellaneous.obj” and reduce the opacity. It’s also possible to select the receiver and change the type of visualization (coloring, change “solid color” and select the desired visualization). This article was chosen because the Fresnel mirrors are flat with a small width. All parameters used are included in Table 1 of the article. However, in the proposed configuration, we define arbitrarily a secondary concentrator that is not optimized and that is not the one depicted in the article of G. Zhu. 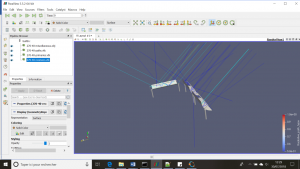 The purpose was only to show a way to include a secondary concentrator in Solstice software. A zip file containing all the necessary files to obtain the results given below should be downloaded here. The .yaml files are generated using a C program. It is important to note that any programming language may be used, we choose C because the post-processing of Solstice is in C. In addition, a program is convenient to write the yaml files because generating many entities by hands is laborious. It also allows the user to change easily the parameters of the installation (number of modules, lines, etc.). 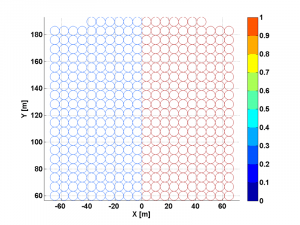 The model uses spectral quantities (DNI and mirror reflectivity). 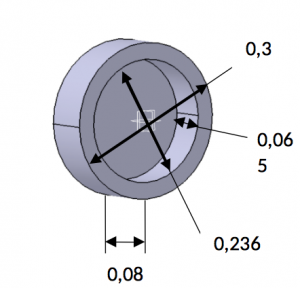 The extremities of the cylindrical glass envelope surrounding the absorber tube were modified. 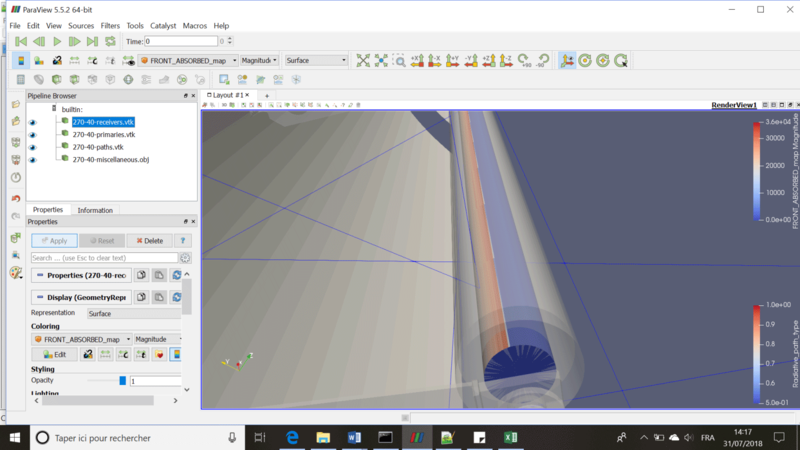 Because the cylinder geometry includes a disk at both extremities, when the inner and outer cylindrical interfaces are defined the inner cylinder should have a smaller length. 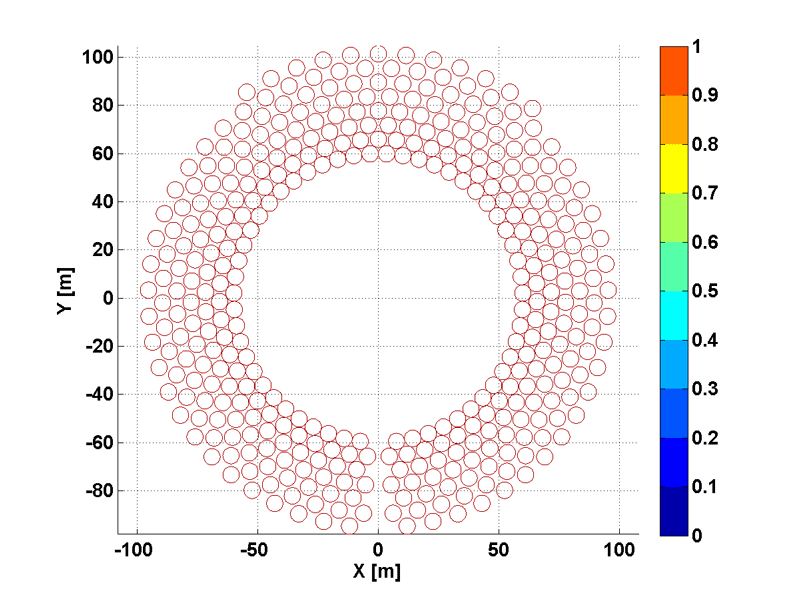 Otherwise, the disks at the ends of the inner and outer cylinders would be superimposed and Solstice would not be able to identify correctly the interface: an error message (“inconsistent medium description”) will be displayed at the execution. At those cylinders ends, dampers are inserted to include a sealing component of the absorber tubes. 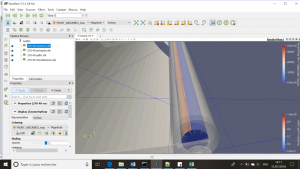 Once the basic “Installation” of Solstice and the first tutorial “First execution of Solstice Software”are done with success, you are ready to run this example. Download the files containing the C program, the STL geometry and the post-process files. Unzip those file to a directory called “FRESNEL_SYSTEM”. Edit and save the READ_ME file to “run.bat”. Open a VS window (as administrator), change directory to “FRESNEL_SYSTEM” and type “run.bat” then hit Enter. 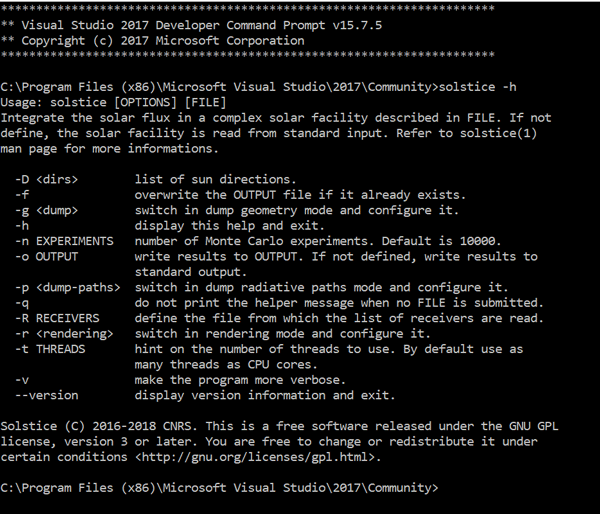 Run Paraview; Open all the .vtk and miscellaneous.obj files that solstice generated in the working directory. To see the absorber, select the“miscellaneous.obj”and reduce the opacity. It is also possible to select the receiver and change the quantity to visualize (coloring, change “solid color” and select the desired variable). 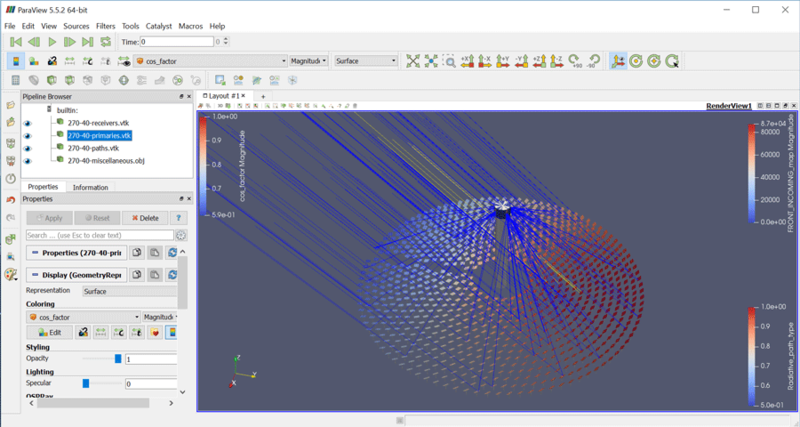 In this example of Solstice software utilization in CSP (Concentrated Solar Power), the solar tower technology is addressed and the simulation of heliostat fields more specifically. A zip file containing all the necessary files to obtain the results given below should be downloaded here. The MUEEN algorithm was implemented based on the article from Siala and Elayeb (2001) . The phyllotaxis spiral arrangement was obtained following the expression used in Noone et al. (2012). For the radial staggered and the corn field arrangement of heliostat positions, in-house routines were used. It is worth mentioning that the codes are delivered “AS IS” and no warranty applies with their uses or performances. All these algorithms are given in the Matlab language which is commercial software. But to run them and produce the file of the heliostat positions, the OCTAVE free software may be used. This software should be installed (if you don’t have Matlab software) to read and execute “.m” files. Anyway, the files containing the heliostat positions are given for a specific configuration of about 400 heliostats. F. M. F. Siala and M. E. Elayeb, Mathematical formulation of a graphical method for a no-blocking heliostat field layout, Renewable Energy, 23, 2001, p. 77-92. 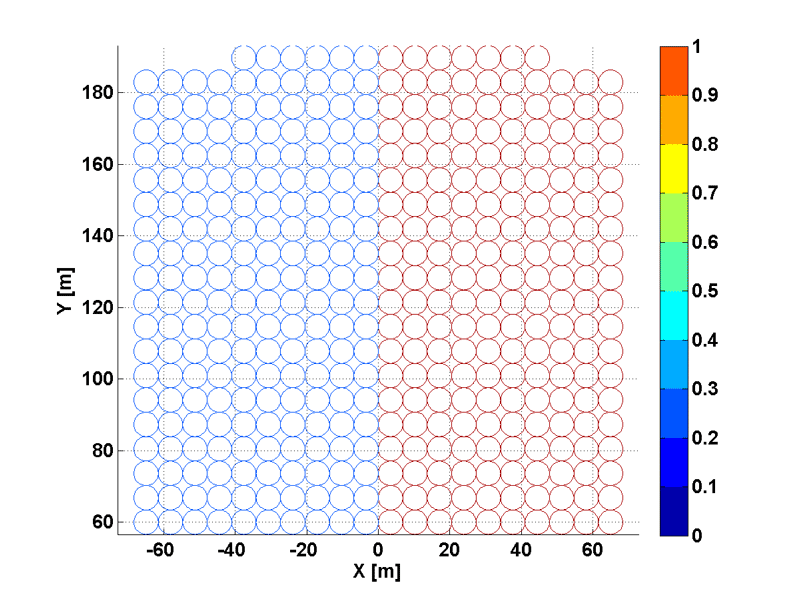 C. J. Noone, M. Torrilhon, A. Mitsos, Heliostat field optimization: A new computationally efficient model and biomimetic layout, Solar Energy, vol. 86, 2012, p. 792-803. 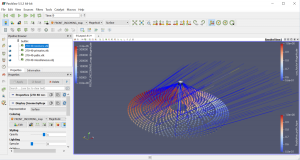 The main matlab program is named “heliostat_field_creation.m”. The function “mueen_fun.m” writes the file “MUEEN_Hgrid.dat” containing the X, Y, Z coordinates of the heliostat center. The function “radial_staggered_fun.m” writes the file “RADSTAG_Hgrid.dat”. The function “corn_field_fun.m” writes the file “CORN_Hgrid.dat”. The function “phyllotaxis_fun.m” writes the file “BIOMIM_Hgrid.dat”. Figure 1. Plots of the heliostat fields obtained with different algorithms: a) MUEEN; b) Radial staggered; c) Phyllotaxis; d) Corn. The two .yaml files used by solstice are created by a C program that help creating many templates and entities of heliostats based on their features and positions. 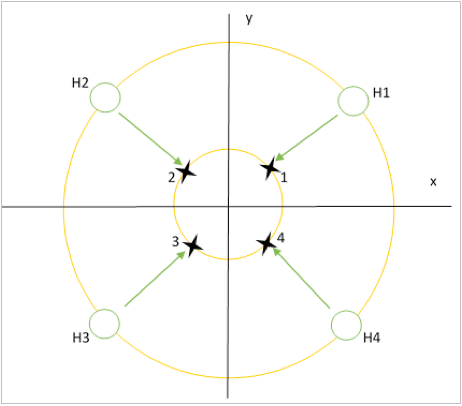 The receiver was chosen cylindrical for circular fields and four aiming points were given to four groups of heliostats. The focal of each heliostat was calculated using its position (x, y, z) read from the data file and an aiming point (Fig. 2) was given to each heliostat depending on which quadrant it belongs. To change the shape of a field, in Matlab main program (heliostat_field_creation.m), PSImax (Pi corresponds to a circular field), Rmax and Rmin may be changed. After running Matlab main program and Solstice (using the READ_ME file converted in run.bat), .vtk, .txt and .obj files should have been created. Run Paraview. File/open/ …. Open all the .vtk and miscellaneous.obj files that solstice generated in the working directory. The results obtained depend on the field used. The following results are obtained using all the algorithms, changing the coloring of the receiver from solid color to FRONT_INCOMING_MAP and the primaries from solid color to cos_factor.